The earliest gardens were not cultivated for pleasure. They were working gardens; much in the same way today’s companion animals were yesteryear’s herders or hunters. But as civilizations blossomed, so did their gardens. If the Garden of Eden had a historical antecedent, chances are it was a farm. 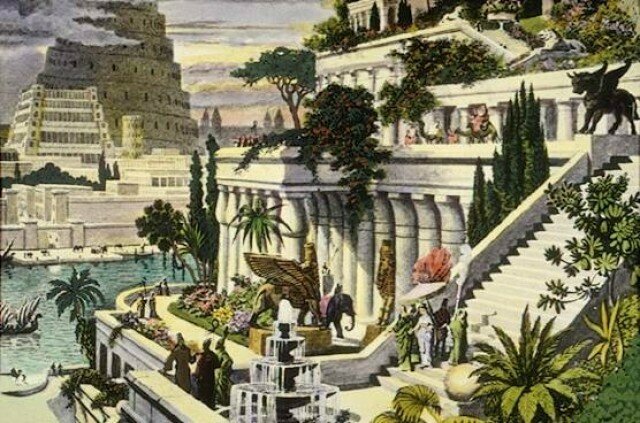 The Hanging Gardens of Babylon came a few thousand years later. Before the medieval ages, behind the walls of every castle or monastery lay a kitchen garden where medicinal herbs and cultivars were grown. These plants were often cultivated cousins of wild species found in the region. Even when the plants had no overt practical use, they carried symbolic subtexts that justified their survival – white lilies for purity, rosemary for remembrance – and gradually the concept of ornamentals was born. Other flowers almost certainly originated as decorative weeds that found their way through wind or bird spoor into the protected garden space and were tolerated because of their visual appeal. In 1260 a Dominican friar, Albertus Magnus, wrote De Vegetabilibus et Plantis, the first description of a pleasure garden. With the Renaissance came the first travel boom Europe had seen since Roman times, and plants were o­ne of the beneficiaries. Botany became a craze; wealthy patrons sponsored plant collectors who traveled the world, bringing home seeds and exotic cuttings. Flowers became prized for their beauty, and beauty is its own excuse for being. The French became the world’s arbiters of horticultural style in the 18th century. Beauty took a back seat to symmetry with the rise of the parterre, a symmetrical pattern of hedges, graveled paths and flowerbeds, best exemplified by the famous gardens of Versailles. A hundred years later, the British naturalistic style became the standard, incorporating year round color from blossoming bulbs, annuals, perennials and tree foliage. Today’s flower gardens borrow from each of the traditions of the past.